Inky Fairy Designs: Pretty Pink Posh Watercolor Blog Hop! Hi everyone! I am so excited to be participating with MarkerPop! in the Pretty Pink Posh Watercolor Blog Hop! I actually have TWO cards to share with you so this is going to be a pretty long post today - hope you will stick around!! After I sent in my card, I thought I would create a video sharing how I created my watercolor background using Faber-Castell Gelatos and then creating a card with that background by using my Copic Markers to color my images - who says you can't combine watercolor and Copics?! In fact, I have seen this type of technique used quite a bit and loved it because I have to admit, I'm a bit of a compartmentalized crafter. If I am using my watercolors, I tend to stick to that and same goes for Copics - it was flying against the wind for me to put this card together, but I honestly love how it turned out and don't be surprised if you see this more from me! 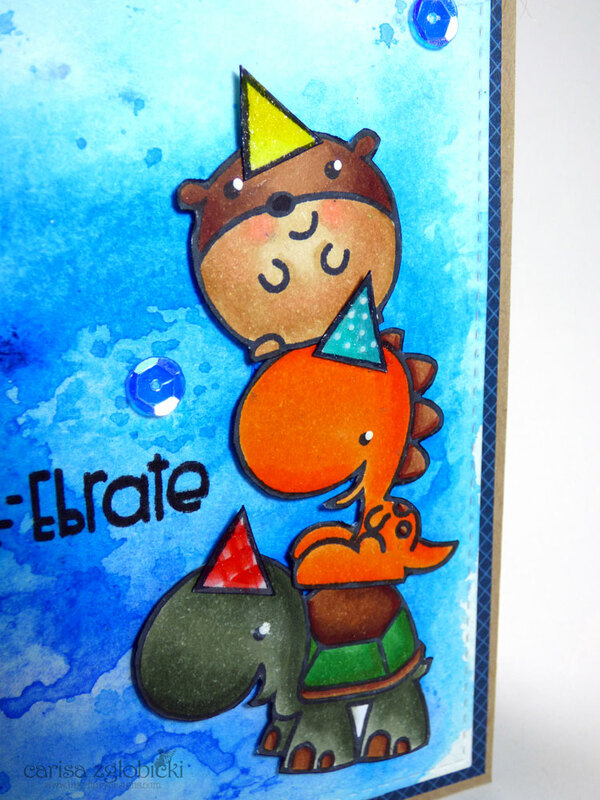 Here is a close up of the Cute little critters from Paper Smooches Party Posse stamp set. Seriously, they just make me smile and they are looking pretty awesome all stacked up in all their Copic colored glory against that beautiful watercolor background! Do you see that I used the same brown color combination throughout each image on different parts? I learned that from the amazing Sandy Allnock and it seriously is a brilliant way to tie together different elements on your card when you are building a scene or just using different images together like I am. I will definitely remember that tip from now on. Of course, what is a card without some Clear Wink of Stella and Glossy Accents as that perfect bit of subtle embellishment. I even threw caution to the wind on this card and added some twine and gorgeous Pretty Pink Posh sequins - I have DEFINITELY been bitten by the sequin bug for sure! I can't seem to create a card without them lately! And as promised…here is the video tutorial showing you how I created the watercolor background on this card and the one below that I created as a special guest with MarkerPop! for the Pretty Pink Posh Watercolor Blog hop. 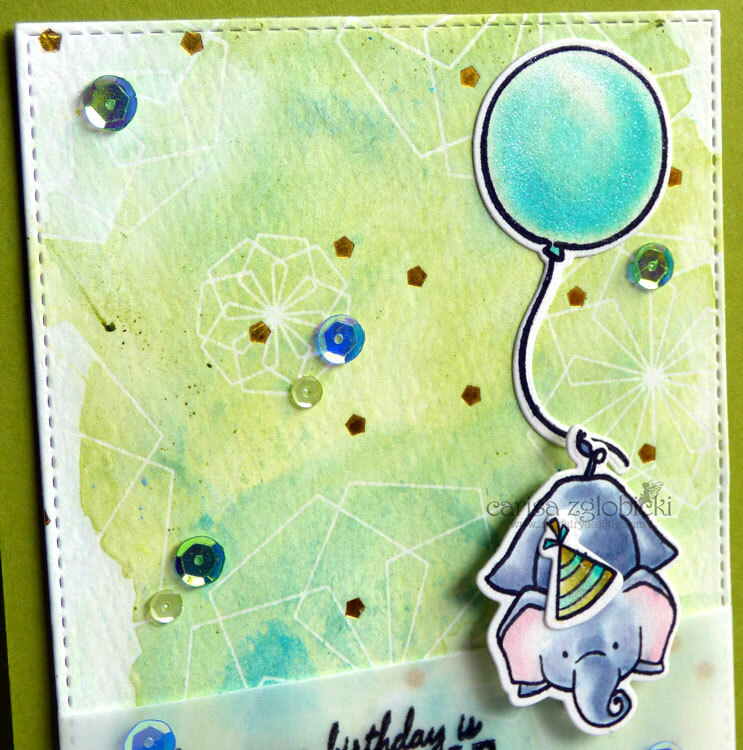 I would also like to enter this card in the current Paper Smooches SPARKS Anything Goes challenge! Here is my card for the Pretty Pink Posh Watercolor Blog Hop. I used the same technique above to create the background. I love these new iridescent sequins from Pretty Pink Posh. I love how they pick up the light and show different tones of color. I love the shimmer on his hat and the balloon - I used a new medium for me, the Winsor & Newton Iridescent Medium for watercolors. I just used it straight from the bottle on top of my already colored image but I would love to try mixing it in with colors on future projects. I hope my two cards and video have inspired you to join in the Pretty Pink Posh Watercolor Hop starting tomorrow! Be sure to check out THIS POST for all the details on how you can join us. Thanks so much for stopping by today and sticking around! If you liked my cards today, please click on the button below to subscribe to my blog so you don't miss a post! 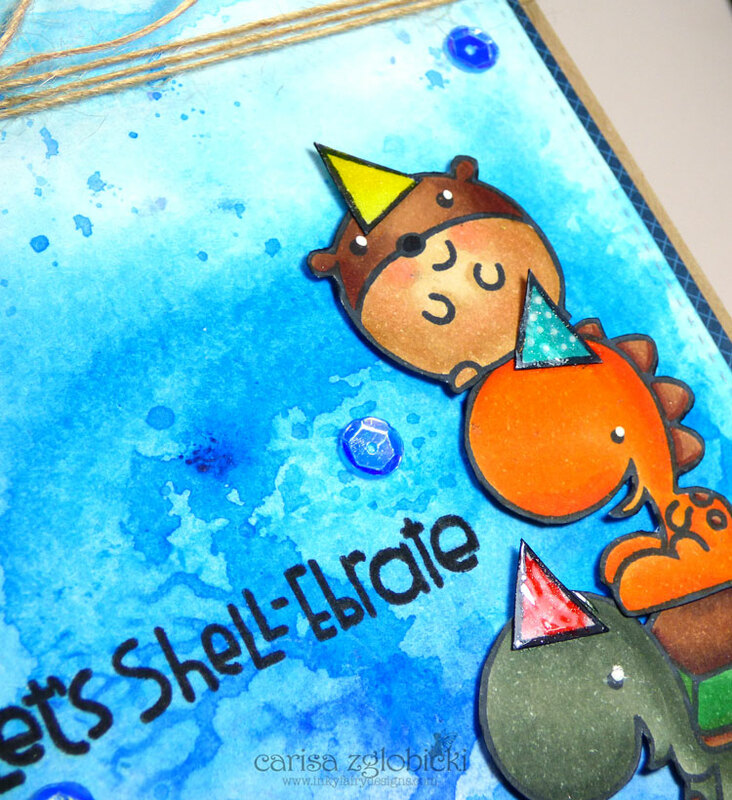 Such a sweet card; I love the cute critters piled up like that! The coloring tip of carrying the same color into all your images is brilliant; takes the stress out of picking so many colors! Stunning watercolors background! I LOVE that WPlus9 card; that elpehant dangling is just too adorable! And that background - stunning! Fun cards! I especially love that darling elephant. Thanks for sharing in the video how you created these great backgrounds. I do not own even one Gelato, (Horrors), but none the less, I was fascinated by watching the video of how you created your colorful backgrounds. 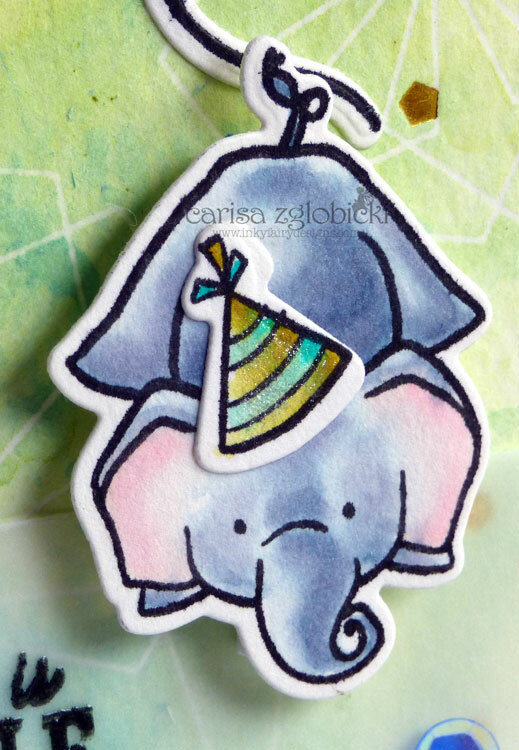 The elephant card is darling. These are both great cards! I love the sparkle and backgrounds. Thank you for the tutorial. It was very helpful and inspiring!